This is a favorite mug - a unique and fun design with a two tone designer look makes the Rock of Gibraltar a great custom mug of choice. Sloping edge and subtle curved deign. Comes in many colors. 12 oz capacity. Inquire for additional imprint options. A staff favorite! 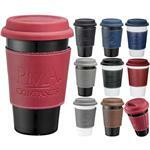 Available Colors: Black exterior, with green, red, sky blue, cobalt blue, white and orange interior. Production Times Available: Allow 10 full working days after Paper Proof Approval. 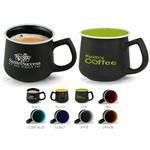 Available Imprint Options: Screen or laser engraving for an additional charge. Inquire for different imprint options. 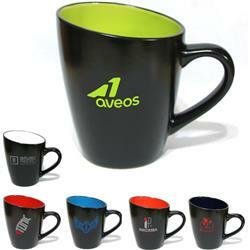 2-tone mug, sloping design, 12 oz, designer, ceramic. 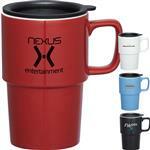 37 pounds per 36 mugs.